Friend of mine refers to cheap, bad games as "shiters". I'd say this qualifies. I remember getting King's Field 1 and 2 on PlayStation 1 during my early years as a 32 bit system adopter, and wondering if I'd taken a quaalude, or perhaps set the PS1 on 33 1/3 speed. The game was s-l-o-w. 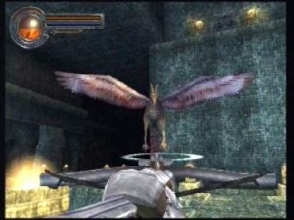 Looking back, however, it had some elements of Oblivion or Morrowind, in that you had the first person perspective, and the illusion of free roaming. OK, perhaps I'm stretching a bit. Having played King's Field IV for a whopping and extensive period of at least 5 minutes, I'd have to say I'm stretching a lot. The graphics may be a major improvement on the PS1 games, and surprisingly good even now (the game originally came out in 2002), the glacial pace still exists. The hand of your character swinging a club down is in an incredibly amusing slow motion. I also particularly enjoyed a cheap death or two, resulting in reloading the entire game, since I hadn't found a save point yet. To be avoided.